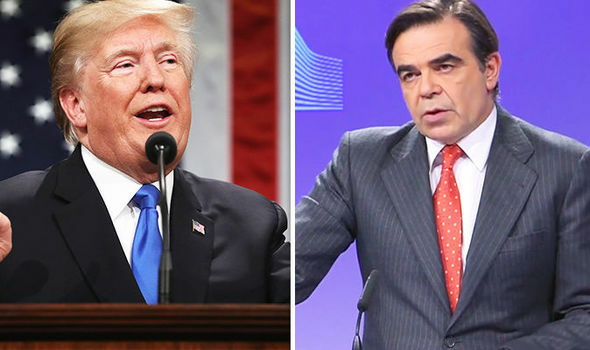 THE EUROPEAN UNION will retaliate ”swiftly and appropriately” if Donald Trump imposes tough trade sanctions on the bloc, European Commission spokesman Margaritis Schinas said. Mr Schinas said trade can and should be “win-win” as he responded to threats made by US President Donald Trump. Speaking at a European Commission press conference on Monday, Mr Schinas said: “We also believe that while trade has to be open and fair it has also to be rules-based. Donald Trump said in an interview with Piers Morgan that he was frustrated with the EU’s trade policy. President Trump accused Brussels of treating the US “very unfairly” when it came to trade. This entry was posted in Business & Economics, Donald Trump, Europe, European Union, Politics, USA and tagged Belgium, Brussels, Business & Economics, Donald Trump, EU, EU threatens trade WAR with Donald Trump as US ramp up trade sanctions worldwide, europe, European Commission, European Union, Margaritis Schinas, Piers Morgan, politics, trade war, United States. Bookmark the permalink.